For 27 years Anime Expo (AX), the largest celebration of Japanese pop-culture in North America, has brought together fans and industry professionals from Japan, the US, and all over the world. The Society for the Promotion of Japanese Anime (SPJA) and host of AX, in continuing their promise to promote and support the industry, has identified Animator’s Support Organization, which operates the Animator Dormitory, as the AX 2018 Charity Auction recipient. Animator’s Support Organization, who assists the next generation of anime content creators, was also the honored charity at AX 2017 where more than $12,500 was raised on their behalf. The nonprofit Animator Dormitory provides discounted housing to the next generation of anime content creators in the Tokyo area. 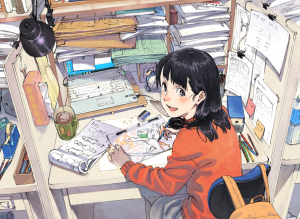 Animator Dormitory was first established in 2010 and in 2014; they opened their first dormitory. In March they opened their first female dormitory and now run four dormitories to support a total of eleven animators. Expanding their reach, the organization recently unveiled an exciting new project to create a brand new anime-making system enlisting the help of well-known animation directors, Animator Dormitory residents and others, even anime fans from all over the world get a voice on what anime story they want to see come to life. Profits from the sale of these anime shorts will go directly to the animators involved. This year, the Charity Auction will be held at Anime Expo on Sunday, July 8 between 10:00 AM and 12:00 PM in Live Programming 3 (408 AB). The Charity Auction will feature items donated by AX 2018 Guests of Honor, and anime-related vendors and companies that will include signed merchandise, memorabilia, and original artwork. Some of this year’s exclusive auction items include an AX 2018 poster autographed by the Guests of Honor. To see a selection of the auction items for 2018, please visit the Charity Auction display in Kentia Hall from Day 1 to Day 3 at Anime Expo.